Check out Discount Tire, online at DiscountTire.com, for an extensive selection of tires and wheels at discounted prices. Discount Tire lets shoppers browse tires and wheels that are close to home and specifically fit to their car, and customers are set up with installation appointment times at local shops. Discount Tire also offers easy credit payment options and information on how to keep tires in shape. But before you shop, be sure to get all the latest DiscountTire.com promotions, Discount Tire savings, and Discount Tire coupon codes, found here at RetailSteal.com. Discount Tire offers in-store installation of tires and wheels. See site for details. Shop at Discount Tire today and receive up to $80 in mail-in rebates for a limited time. Click here for up to $70 instant savings on wheels at Discount Tire. Shop today for this limited time offer. Shop at Discount Tire and enjoy free shipping on your purchase. Click here to shop! For a limited time, get a $50 Visa prepaid card with a purchase of a 4 tire and wheel package. Click here to start! 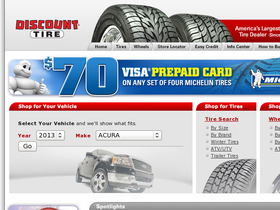 Get either 4 tires or 4 wheels at DiscountTire.com and get a $30 Visa prepaid card! Click here for this special offer. Shop at Discount Tire to find wheels under $100. Click here to shop and save. Shop at Discount Tire and save with rebates and special offers on select purchases. Click this link to start.